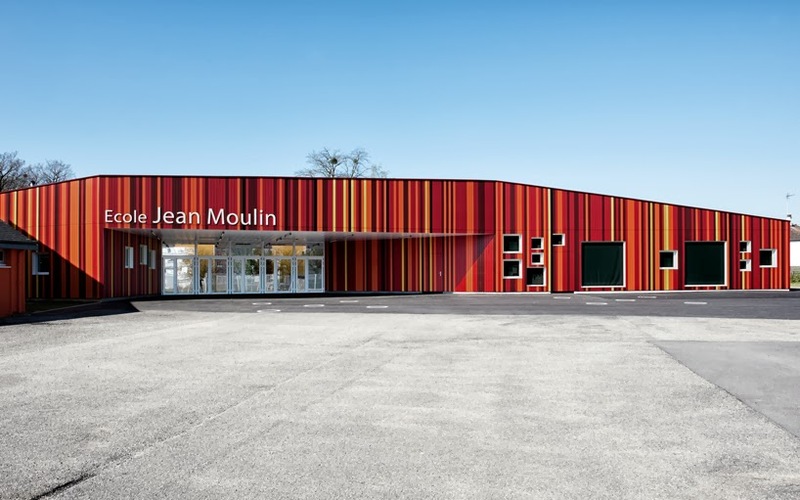 Earlier this year in Normandy, France, the Jean Moulin Elementary School reopened after a terrible fire burnt much of its structure to the ground. And this was no accident, the fire was the result of an arson attack. 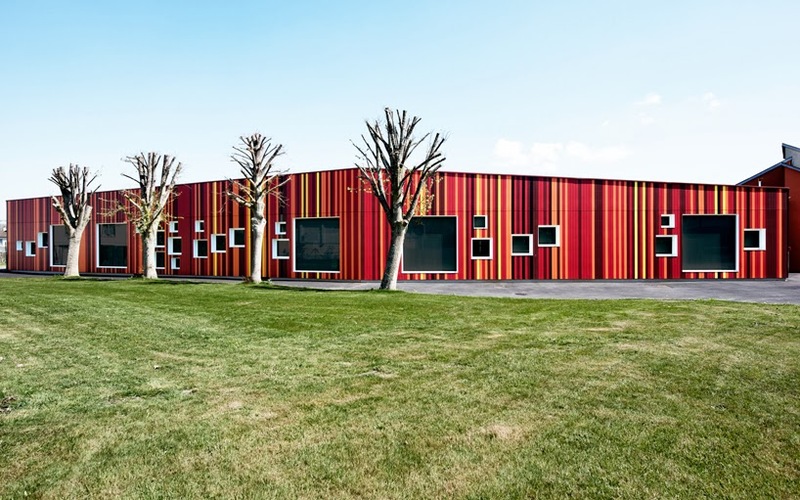 A fire, and especially a fire at a school is a tragic and scary event for any community but this school and the minds at Prinvault Architectes decided to face those fears straight on. 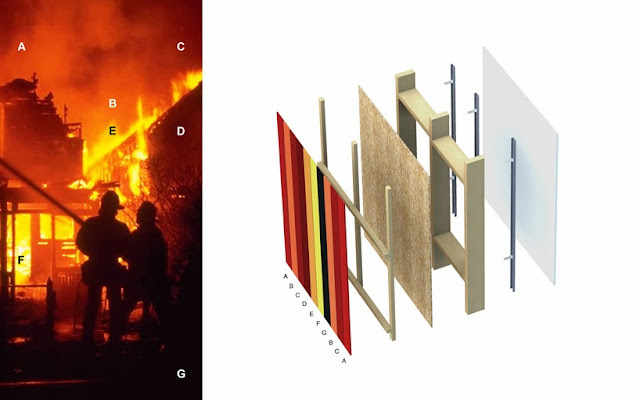 Using colors taken from photographs of the fire the buildings new scheme acknowledges the past while looking toward the future, all with color! To achieve the color palette the architects analyzed a digital photo to find that "a spectrum of 2.5% black, 2.5% zinc yellow, 2.5% yellow gold, 2.5% red-brown, 25% orange-red, burgundy 25%, and 40% carmine red " comprised the hues of the fire. Once the colors were chosen and organized by quantity the team used a list randomizer to choose the order of the colors along the facade. 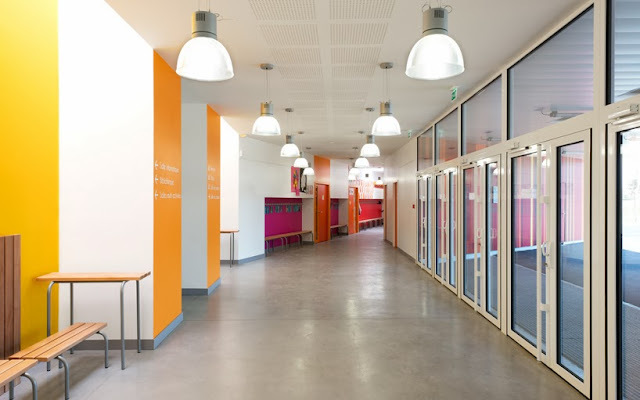 The interior also transforms the colors of the burning fire into a warm happy energetic color scheme. Paired with a main hallway lined with kid sized alcoves for playing games, reading and studying the whole school feels rich and welcoming. So while your next color project may not be on this scale we can take techniques used in this project and apply them to our own for new and creative color inspiration. In a previous post we introduced you to Kuler, Adobe's fantastic color palette creator. Its lets you create color combinations using a straight color wheel or upload an image and play with combining colors directly from it. For our adventurous readers we recommend taking the list of colors you generate from your images and after deciding on the quantity of each (how many times each should appear in your project and thus on the list) pop them in to this list randomizer and see what computer assisted color magic you can come up with. 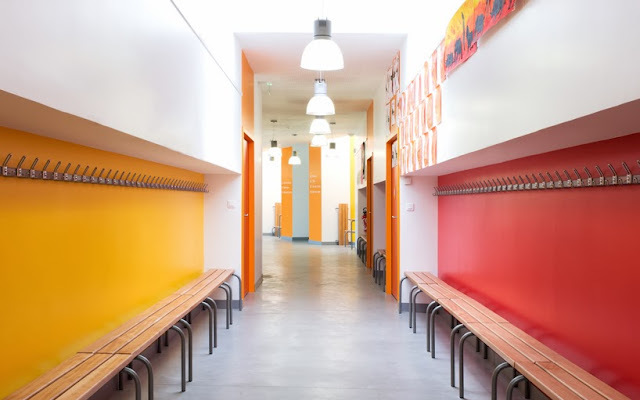 If you use this technique for your next color scheme we'd love to hear about it! We are concerned not only about our personal life; we also worry about kids, spouse, and friends. With today’s spying opportunities, we see what is really going on and find out the truth. Click check the blog about spy on someones facebook for more details!